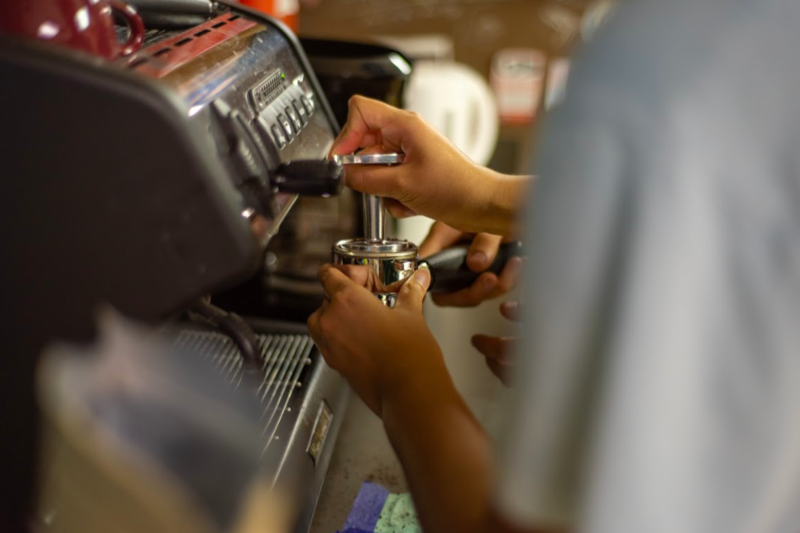 Southwestern University offers a variety of daytime hang-out locales on campus, but there is one space on campus which belongs wholly to the students: Korouva Milk Bar (often referred to simply as KMB). Korouva Milk Bar is special because every aspect of the business, from choosing and promoting events to allocating finances and mixing drinks, is under the student volunteers’ management. The cafe is located at the edge of campus on Maple Street, nestled between the SU police station and the Kappa Alpha fraternity house. Even from the outside, it stands out from the rest of campus, marked by a bright red door with “Korouva Milk Bar” inscribed across it in loving (if a little messy) black text. Once you enter the small room, it becomes even more clear that this isn’t exactly a university space. Each tile of the ceiling is its own individual art piece, painted by different students at Korouva’s “tile-painting parties,” and replaced every couple of years as the panels fill up. Every inch of the room pulses with color, hinting at the generations of students who have spent time here and made it their own for their four years at Southwestern. This small room is the backdrop for the weekly meetings of several student organizations, as well as events organized by the KMB organization itself. I have been enchanted with Korouva Milk Bar since I initially visited it my first year. With the goal of finding out what goes into the management of this unique venue, I sat down with Hays and Sam, two juniors who have volunteered at Korouva for almost two years. I also spoke with Zoe, a Southwestern senior and the current manager at KMB, who wasn’t able to meet in person but was kind enough to be interviewed via email. As I spoke to the other KMB volunteers, I learned that they, too, felt that it has come to represent a great deal more to the Southwestern student body than just a place to drink a smoothie or prepare for a quiz, even if its primary function is as a cafe. According to the KMB volunteers, the business started in the early 1990’s. At any rate, that’s as far back as their records show. Apparently, it was conceptualized much more like its fictional namesake– the Korouva Milk Bar from Stanley Kubrick’s cult horror classic, A Clockwork Orange, a place with a much darker atmosphere which only served coffee and milk drinks. This change initially began in the early 2000’s, but has continued through the years and, over time, more smoothies and milkshakes have been added to the menu, and generations of students have come and gone and changed the face of Korouva. It seems that students volunteer at the Milk Bar for a variety of reasons, ranging from reaching their goals for volunteer hours to meeting new people to learning new skills. Unfortunately, Korouva being an entirely volunteer-run student organization poses some serious obstacles for the future of this unique business. One of the venue’s most popular recurring events is coming up, open to the entire student body and free of charge: an annual Halloween edition of Korouva Milk Bar’s Open Mic Night, entitled “Spookeasy.” The event will take place from 9:00 pm-12:00 am on Thursday, October 25th. “Open Mic is a chance for artists to perform in a lowkey environment and hang with friends,” Zoe said, describing the monthly event. If you want to learn more about Open Mic Night, Korouva Milk Bar as a whole, or see what volunteering there has to offer, they are open for business, fixing homemade smoothies and milkshakes, 8:00 am to 11:00 am Monday-Friday and 7:30 pm to 12:00 am Sunday-Thursday. To learn about upcoming events, you can follow KMB on Instagram @korouvamalkbar. If you are interested in volunteering and helping keep this incredible business going, contributing to the upkeep of this venue that is in Southwestern but not of Southwestern, email KMB’s current manager, Zoe Watts, at wattz@southwestern.edu.